"Invented in the 1920s, quark was a cross between yoghurt and cream cheese," I read in Lizzie Collingham's book The Taste of War: World War II and the Battle for Food (p. 354). My attention was riveted: this very late date for such a traditional product really surprised me. 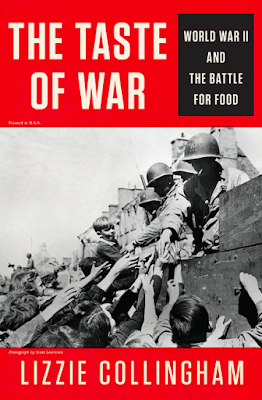 Because Collingham's excellent and challenging book seems very reliable and has lots of footnotes, I tried to find out more. "Funny name. Delicious stuff. Quark can be classified as a sort of curd cheese somewhere between yogurt and small-curd cottage cheese. It's quite low in fat, versatile in the kitchen and, like yogurt, is sometimes sold blended with fruit." Many products -- including quark -- are generally known as white cheese or non-aged cheese. You surely know some of them: French fromage blanc; Greek, Turkish, Israeli, Polish, Russian, and other white cheeses; maybe Icelandic skyr; Italian ricotta; and American cottage cheese and farmers' cheese. These differ in fermentation times and agents, in size of the curds (if any) and ultimately in taste and texture. Interchanging them in recipes doesn't necessarily give consistent results -- and could be a big mistake! which has gone through many editions in well over a century. But let's get back to the question of the history of quark and of the wonderful word itself. 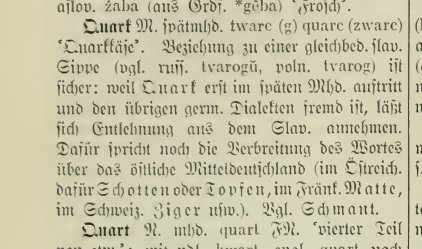 According to the etymological dictionary I consulted (see image), the word came from Russian "tvarogü" and Polish "tvarog" through late Middle High German, other German dialects etc. In other words, both the word and the cheese have a long history -- even if they only became popular because they fit into Nazi ideological food ways. Fortunately this part of the history is well forgotten in the more recent use of quark in German cuisine and the introduction of quark to American consumers! “In 1963, when I assigned the name "quark" to the fundamental constituents of the nucleon, I had the sound first, without the spelling, which could have been "kwork." Then, in one of my occasional perusals of Finnegans Wake, by James Joyce, I came across the word "quark" in the phrase "Three quarks for Muster Mark." Since "quark" (meaning, for one thing, the cry of a gull) was clearly intended to rhyme with "Mark," as well as "bark" and other such words, I had to find an excuse to pronounce it as "kwork." But the book represents the dreams of a publican named Humphrey Chimpden Earwicker. Words in the text are typically drawn from several sources at once, like the "portmanteau words" in Through the Looking Glass. From time to time, phrases occur in the book that are partially determined by calls for drinks at the bar. I argued, therefore, that perhaps one of the multiple sources of the cry "Three quarks for Muster Mark" might be "Three quarts for Mister Mark," in which case the pronunciation "kwork" would not be totally unjustified. In any case, the number three fitted perfectly the way quarks occur in nature.” ― Murray Gell-Mann, The Quark and the Jaguar: Adventures in the Simple and the Complex, cited in Goodreads. How interesting! I thought quark had something to do with computers. I'm nerdy enough that when I first saw the title to the post, I thought physics. :-) Love the word -- it just rolls off the tongue, doesn't it? 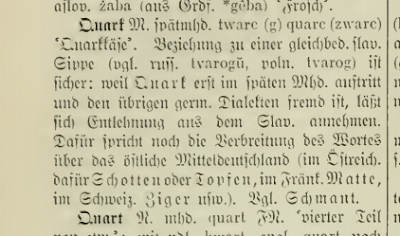 Had no idea quark (both word and dairy product) dated back to the 14th century. Fun stuff -- thanks. Who would've thought! I've never heard of the word, and am happy to have learned something new today! I was familiar with the scientific definition but not the foodie one! Wow! That's a good and interesting word. I like the history you found. I'd heard of the scientific quark but not the food one. Fascinating! Now I'm curious to try some. Thanks for the detailed history of the word. The word quark always reminds me of Star Trek characters!! When I was a teenager I worked in the deli section of the supermarket and we sold quite a lot of quark but I never really knew what people did with it! Both ricotta and quark seemed so exotic back in the day! !